We have introduced smart phone technology to make parking more convenient. PayStay allows you to park without having to search for coins or trekking to a meter. If you don't stop the session, you’ll be charged the maximum fee for that parking zone. 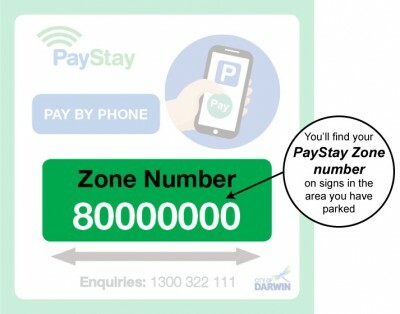 If you wish to park for longer than the time on the sign (for example, more than two hours in a ‘2P’ area), you must first move your vehicle to a new PayStay zone (this means the zone number changes). PayStay's instructional video provides simple instructions on how to use the mobile phone app. We've put together some of the most frequently asked questions about PayStay to help get you started. If you'd like to find out more information the PayStay website is a handy resource. What if I don't own a smartphone? Call 1300 322 111 to set up your account and instructions for phone pay. Will I only pay for what I use and only be charged for this amount of parking? You will continue to be charged until you press Stop or until the time has lapsed/maximum amount for your parking zone has been reached. Can I renew my session once I've reached the parking time limit? No, this is considered an overstay. The maximum time allocated to a PayStay session does not go beyond the allocated parking time zone (eg 2P signage = 2 hour max session). Infringements can be issued for any overstay in a parking time zone. Timed areas are signed accordingly (e.g. 2P = 2 hour maximum parking). There have been no changes to the location of parking zones across the city. Once my session has expired, am I able to activate a second session for the same car park? No, this is considered an overstay. If you are required to be in the area for a longer period of time, you will need to move your vehicle. The maximum time allocated to a PayStay session does not go beyond the allocated parking zone (eg 2P signage = 2 hour max session). Infringements can be issued for any overstay in a parking zone. You are not able to activate a second session within the same PayStay zone. You can move to another PayStay zone to begin a new session. Should you return to the area later in the day, you could return to the same zone and activate a new session. Are there any fees for using PayStay? No transaction fees are charged. SMS alerts incur a fee. You can change your settings to opt-in or out of SMS alerts. PayStay may set a minimum account balance requirement. Your account balance may be automatically topped-up using the credit card on your account. Can transactions be reported or printed for audit and tax purposes? Can records be split for private and work-related parking expenses? Reports are generated for each vehicle and are unable to be split between private and work-related use for that vehicle.